I had a busy but fun weekend - I checked out a jazz festival on Friday after work, went to a Pirates game on Saturday evening, and then went to brunch on Sunday to celebrate Father's Day! I also had to make sure to squeeze in some homework and blogging, too, and at least a little bit of relaxing - I finally watched the new Beauty and the Beast! 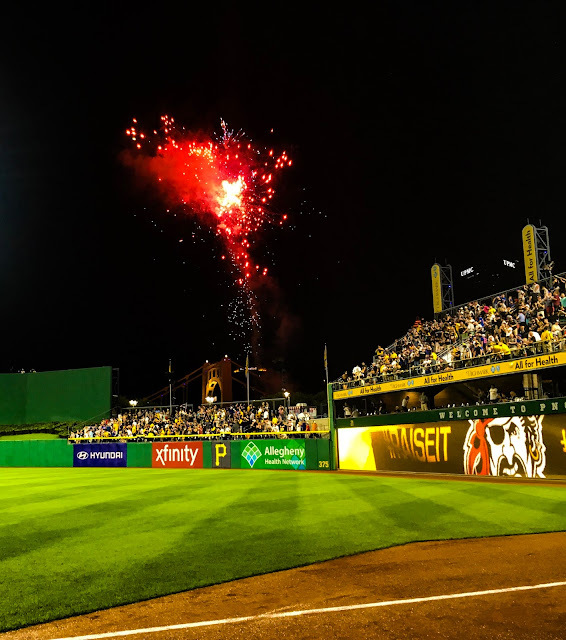 I'll talk about the jazz festival in another post, but I wanted to talk about my time at the Pirates game. My friend ended up having an extra ticket and invited me to join - I'm so glad that I did! 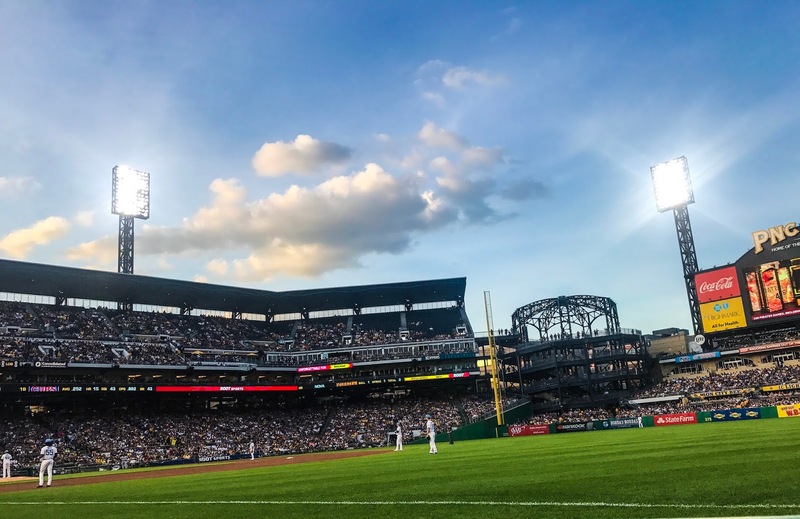 Not only did the Pirates win, but PNC Park is such a beautiful field and I sometimes forget how much fun it is going to a game! 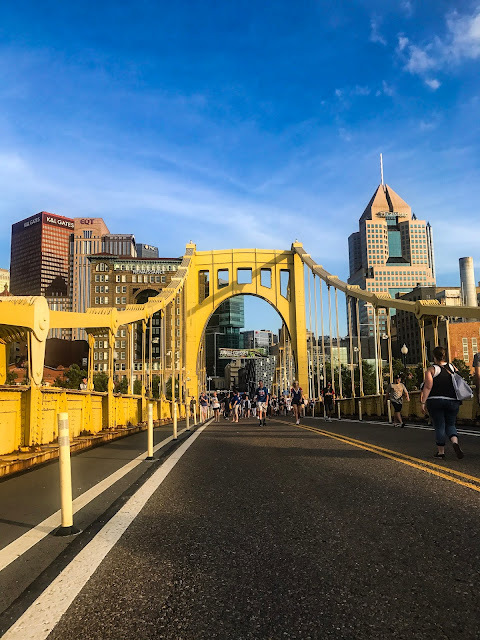 The city closes one of the bridges connecting downtown to the North Shore, where PNC Park is, so that people going to the game can walk across. What a stunning view! It turned out that our seats were on the field level, which was incredible! I've never sat that close at a baseball game - I'm not a huge fan, but it's definitely easier to pay attention when you can see the action up close. 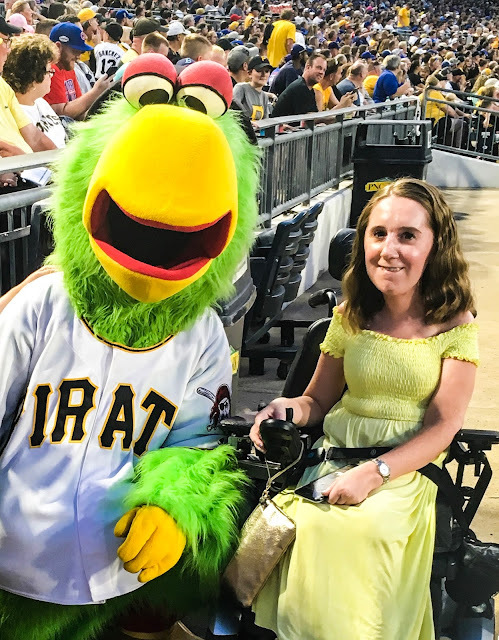 The handicapped seats at a big field like PNC Park are usually pretty limited, and almost always the top row of a section, not at the bottom, so this was a really great surprise. We ran into the Pirate Parrot, so we had to get a picture with him! I was also lucky enough to end up with one of the foul balls from the game - a very sweet Pirates staff came over and gave it to me. And since the game ended with a win for the Pirates, it also ended with fireworks! It was the perfect end to a great night.